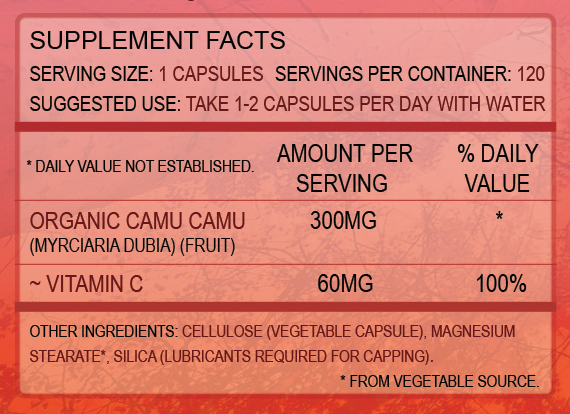 – 60mg (20%) of each 300mg capsule is vitamin C! Camu camu is a fruit which is native to Brazil. It contains the highest concentration of vitamin C known of any fruit, and when powdered, contains as much as 20% vitamin C by weight. Aside from a high concentration of vitamin C, camu camu powder contains a variety of other bioflavinoids, vitamins, minerals and polyphenols. 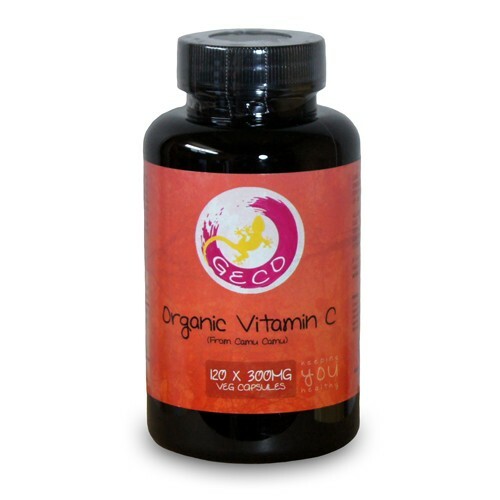 These additional nutrients aid with the absorption of the vitamin C, and offer additional health benefits. Having vitamin C in this natural food form avoids chemical residues, acidity problems and poor absorption which is associated with synthetic vitamin C. Camu camu powder is a natural way to increase the amount of vitamin C in your diet, and protect your body from oxidative stress. This product is also grown organically, and the greatest care is taken in the growing, harvesting and manufacturing to ensure a completely natural product.